Welcome back for day 2 of our blog hop! 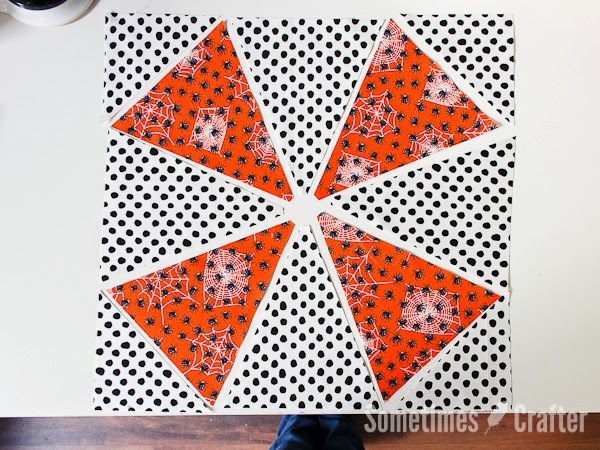 We're looking ahead to Halloween today as Christina from Sometimes Crafter shares her tutorial for a Halloween Medallion Quilt made using a kaleidoscope ruler. 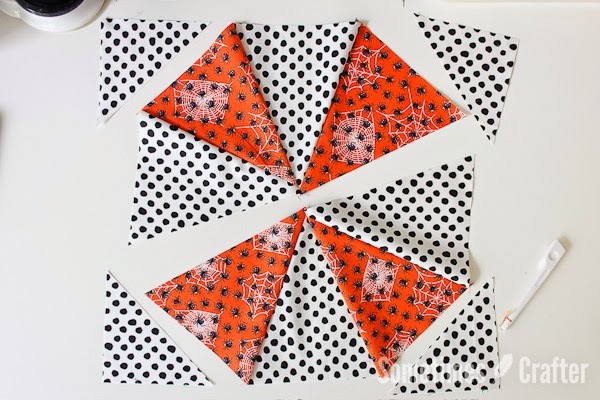 She pairs novelty Halloween prints from Spooktacular with coordinates from both Harvest Song and Palm Springs for an eye-catching orange, black, white and purple wall hanging. Enjoy her tutorial and then find out at the bottom of the post how you can win a bundle of Spooktacular prints! Halloween is one of my favorite holidays of the year. For me it means lots of decorating and crafting. I'm not sure how it happened, but I am without a Halloween quilt to grace my couch and I knew that needed to be remedied this year. 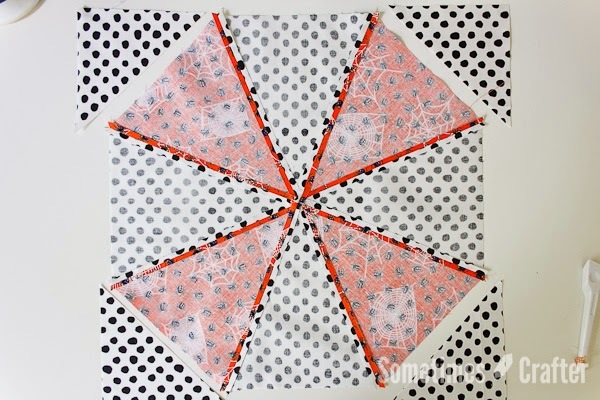 I think this kaleidoscope quilt was the perfect way to display a few Halloween fabric favorites. The finished size of this quilt is approximately 48" x 48" - just the right size for curling up on the couch with a scary movie. Kaleidoscope quilt blocks are quick and easy to make and give so many different results depending on your fabric placement. I especially love how the straight lines gives the illusion of curves when the blocks are placed together. For this quilt top you will be cutting and placing fabrics to create a center medallion encased within a "circle." This quilt is a great time to use low volume, or small prints for your background, so be sure to choose a fun background print. 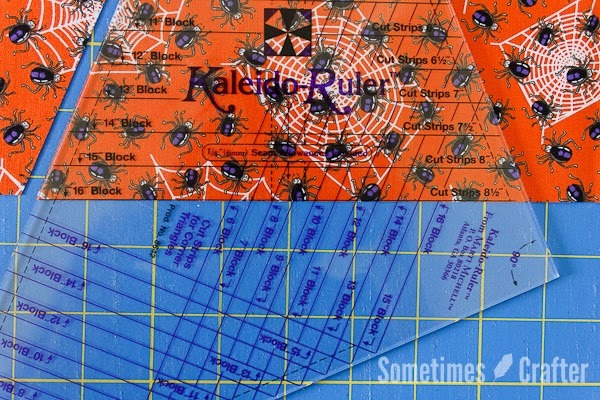 Kaleidoscope quilts are full of funny little measurements of 1/16th to 1/32nds of an inch, so for this tutorial I will be using From Marti Michell's Kaleido-Ruler to make 16" blocks. The ruler makes the task of cutting out pieces for a kaleidoscope quilt not only more accurate, but also faster. The Kaleido-Ruler I'll be using makes blocks from 6" to 16". I was so glad for my impulse buy of this ruler so many years ago. Once you see how quickly these blocks and the quilt top go together, you'll be glad you have this ruler to make even more kaleidoscope quilts. Before we start, I want to talk about seams. ​For this quilt I pressed all of my seams open. I know that this is not generally considered a "proper" way of doing things, but you will be so much happier with your end result if you press your seams open. 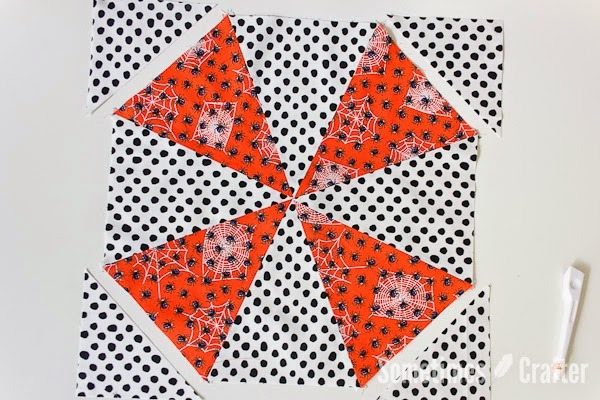 After all those triangles come together in the center of the block, it can get quite bulky when pressing seams to the side, which not only makes the block bump up considerably, but can also stall a machine when quilting over it. I plan on quilting this top with a moderate to slightly dense pattern, so I won't be worried about seams coming open​, and today's battings are so well made that I have never had trouble with bearding of my batting through the seams. Keep all of this in mind, and make the choice that is right for you. Begin by pressing all of your fabrics with a hot steam iron to work out all the wrinkles. This step is important when working with the kaleidoscope ruler to ensure our cuts are as accurate as possible. Following this, I will give instructions for cutting your isosceles triangles (we will refer to them as Triangle A from here on out) and your right-angled triangles (we'll call these Triangle B). 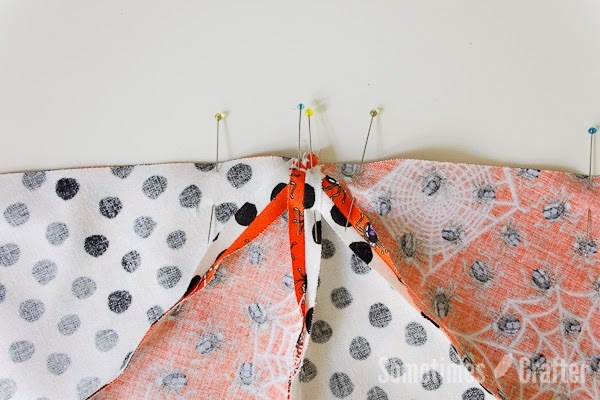 After these step-by-step instructions you will then see a list of strips needed from each fabric, as well as the number of triangles that need to be subcut from those strips. 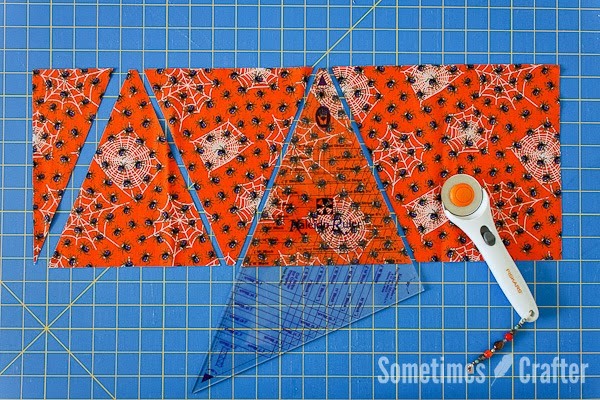 To save time, you can stack your strips of fabric when cutting your triangles, just be sure to not stack more than two folded strips at a time (in other words, no more than four layers of fabric). From each of the fabrics, cut the specified number of 8.5" x width of fabric strips, being sure to square up the edge of the fabric before cutting the strips. (If you are using a fat quarter for this, your width of fabric will be the 22" length.) Lay your cut strip in front of you so that the length runs parallel to you and the bottom edge of the cutting mat. Go ahead and leave your fabric folded when working from yardage. Using the Kaleido-Ruler, line up the black line on the isosceles triangle side for the 16" block (this is the side with the Marti Michelle logo on it) with the bottom edge of the fabric strip, as far to the left as possible, and cut along both sides of the triangle. You will discard the piece on the left and set aside the triangle under your ruler. This image shows you the 16" Block line on the ruler lined up with the bottom edge of the fabric strip. That is the line you will use to make all of your Triangle A's. You should also notice, when this line is on the bottom of your strip that the top, blunt point of the ruler is flush with the top of your strip. Rotate your ruler so that the black line for the 16" block is at the top of your strip. 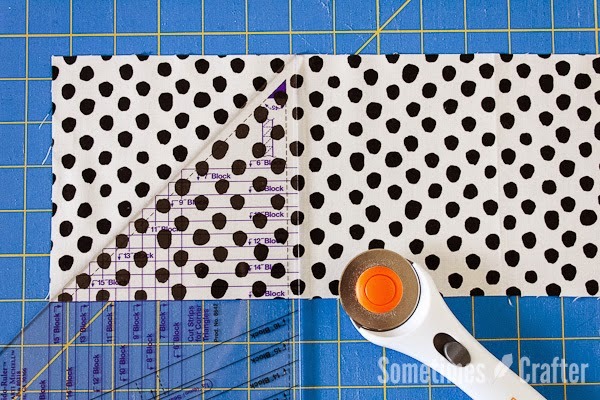 Line up the left edge of the ruler with the last cut you made on the fabric and cut along the right side of the ruler. Set aside the triangle under your ruler. 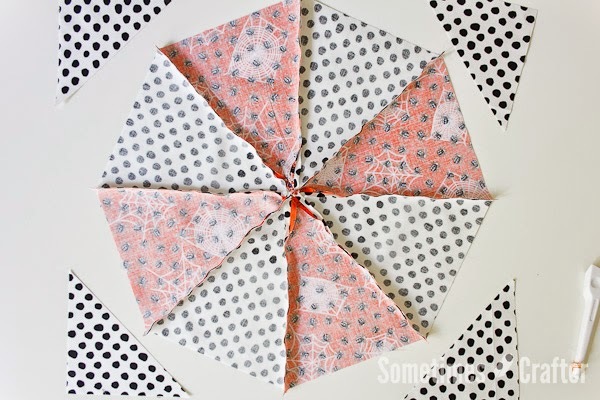 You will repeat these sames steps to cut all of your equilateral triangles. 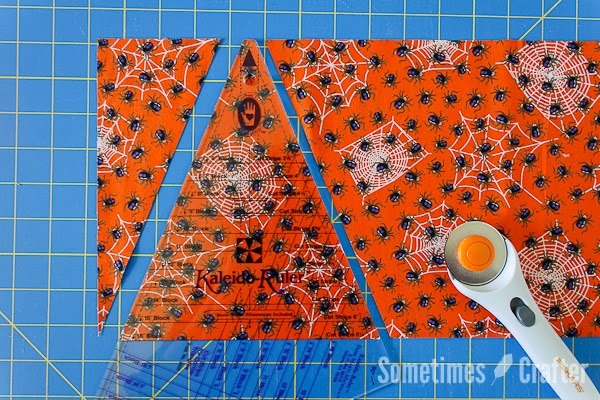 * Spooky Spider: 1 - 8.5" x WOF strip; 4 Triangle A pieces. 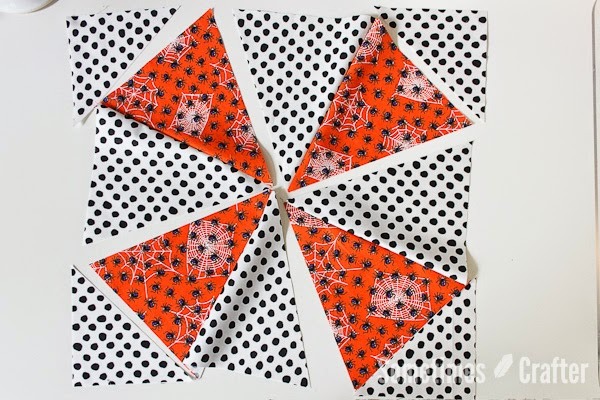 * Dot Orange: 1 - 8.5" x WOF strip; 4 Triangle A pieces. * Spider Web Black: 2 - 8.5" x WOF strips; 16 Triangle A pieces. * Fraidy Cat Purple: 2 - 8.5" X WOF strips; 12 Triangle A pieces. * Dot All Over Black (Background): 4 - 8.5" x WOF strips; 36 Triangle A pieces. 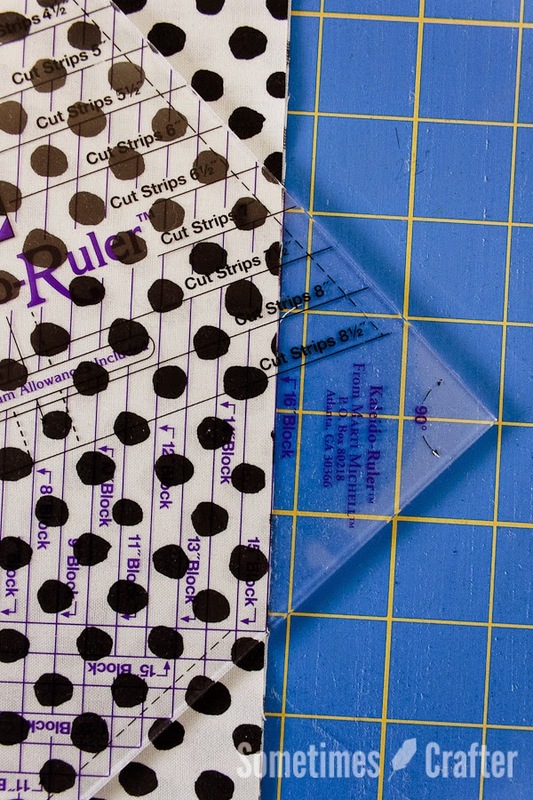 To cut your strips from the fabric yardage for these triangles, you will be using the Kaleido-Ruler to achieve the correct width of the strip. Orient the fabric with the selvage edges towards you and the bottom of your cutting mat, and the fold at the top. Square up the RIGHT edge of your fabric. Using the purple lines that run parallel to the long edge of the ruler (you will see "Cut Strips for Corner Triangles" on the ruler, with the lines for your block size you're making above it), line up the purple line for the 16" Block on the RIGHT edge of your fabric. The 90 degree point will be to the right of the fabric and the long edge will be on your fabric several inches in from squared edge. Using a 24" long ruler, and holding the Kaleido-Ruler in place firmly with your right hand, slide it up to the left side of the Kaleido-Ruler, flush to the long, straight edge. Hold the 24" ruler firmly in place and then slide the Kaleido-Ruler out of the way and cut along the right edge of the 24" ruler. 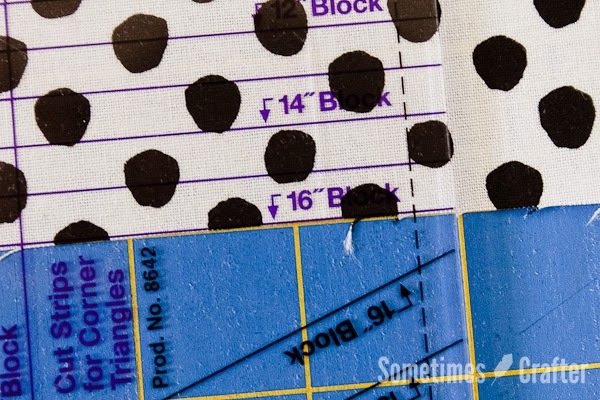 This strip, to the right of the ruler, is the strip you will use to cut your Triangle B's. 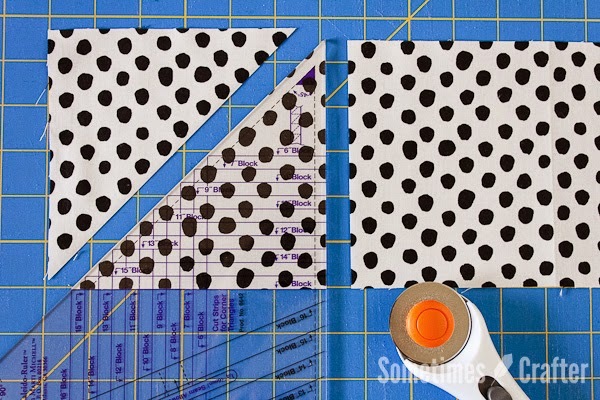 To cut the triangles, lay the strip of fabric on the cutting mat so that the long edge is parallel to the top and bottom of the cutting mat. If you left your yardage folded, make sure the fold of the fabric is to your right. Using the 45-degree, pointed tip of the ruler, find the 16" Block purple line and lay that onto the bottom edge of your strip. The point of the ruler should be flush with the top of your strip. This photo shows the purple line for the 16" Block flush with the bottom of the strip. 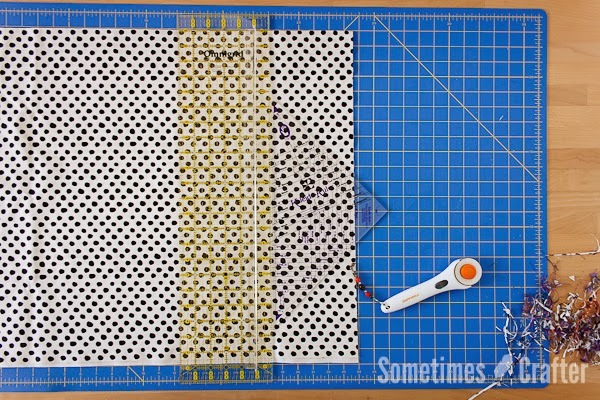 Using your rotary cutter, cut on both the right (straight) and left (diagonal) side of the ruler. 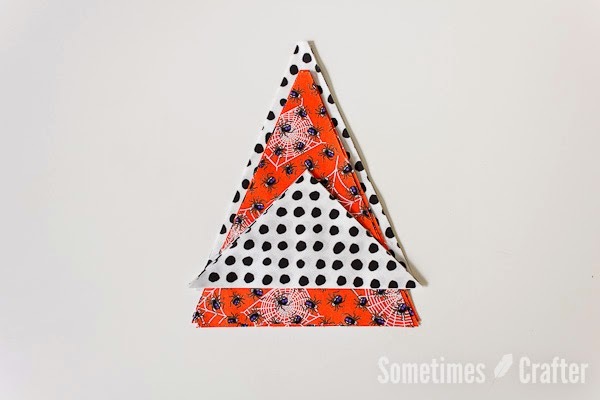 This will give you two triangles (or four if your fabric was still folded in half). Repeat until you have the desired number of triangles. Each width of fabric strip will give you 14 triangles. * Dot All Over Black (background): 2 - Kaleido-Ruler 16" Block strip width; 20 Triangle B pieces. If you would like to see videos of how this ruler is used, this link has a 4 part series on using the Kaleido-Ruler (Cutting and Making the Kaleidoscope Block). Once all of your pieces are cut, I recommend placing them into 9 separate piles, one for each block. Working with one block at a time, I like to lay them out as they will be sewn together. 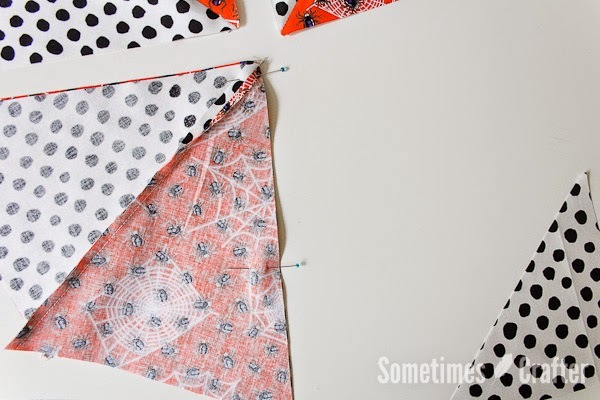 Begin by sewing the center Triangle A pieces together, sewing a print to a background piece, keeping with the pattern of the block. Repeat for all four pairs. After these pairs are sewn together, I finger press the seams open at the points of the block, up about an inch or so. Matching two pairs together along their sides, sew together. Repeat for the other two sets. At this point you will have two halves of an octagon sewn. Finger press the seams open at the blunt points, up about an inch or so, and match the center seams on both halves to each other and pin in place along the seam allowance. I prefer to pin on each side of the seam allowance so there is no shifting when sewing. Sew the two halves together. You will now have a completed octagon that needs its seams pressed. This photo shows what the back of your block will look like. Press all of the seams open with a hot steam iron. Finally, sew the four corner pieces to the octagon piece, matching the centers of the corner pieces with the center of the triangle it will be sewn to. I find the easiest way to do this is to fold the pieces in half and finger press and then match the centers and pin. After stitching all four sides, press your seam allowances open with a hot steam iron. You may find there is a small amount of wrinkling at the center of your piece. Simply spray with water and press with a hot steam iron until you are happy. I was able to get mine to lay flat without any wrinkling. Assemble all of your blocks in the same fashion, referring to the diagram below as you sew for proper fabric placement. Your block should measure 16.5" square when finished. Once all of your blocks are assembled, lay them out in order, making sure blocks are turned appropriately, so there are no mistakes when sewing. Sew the blocks together in rows (top row, middle row, then bottom row) and press seam allowances open. Sew all three rows together, and press seam allowances open. To create your backing, cut your backing fabric yardage in half so that you have two pieces measuring 54" x width of fabric. Sew the pieces together along their 54" length. Press your seam as desired. Your backing will measure 54" x 88". Trim if desired to 58" x 58", making the backing approximately 4" wider on all four sides than the quilt top. To bind this top you will need approximately 6 strips of fabric. 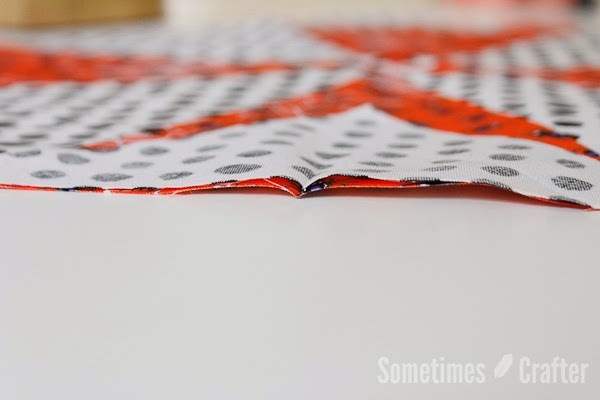 I like to cut my fabric 2" wide x width of fabric, but enough yardage is provided for wider binding widths.​ For a thorough tutorial on creating quilt binding, and sewing it to your quilt top, I suggest checking out my 3 part binding tutorial series. I think you will be surprised just how quickly this quilt goes together. It can easily be cut and pieced in a day. I had hoped to have the quilt quilted by the time this tutorial went live, but as a professional longarm quilter, I can never seem to get my own quilts loaded and quilted. I do hope to have this quilted in the next week or two, so I hope you will keep an eye on my blog where I will share photos of the quilting. I'm thinking spider webs! 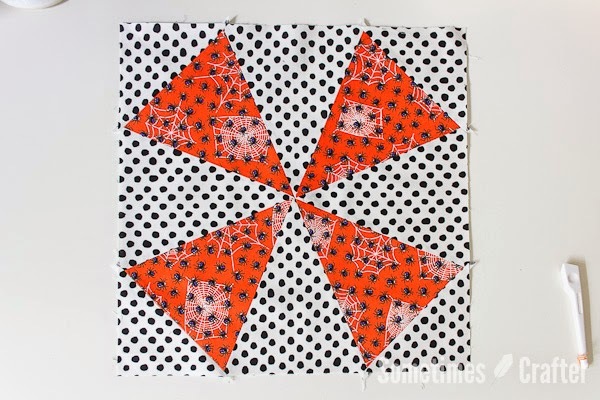 I will also be sharing a photo of another quilt I made using black and orange fabrics from my stash in a slightly different layout, so please stop by and take a peek. Happy quilting! Thanks Christina! Love the kaleidoscope look! 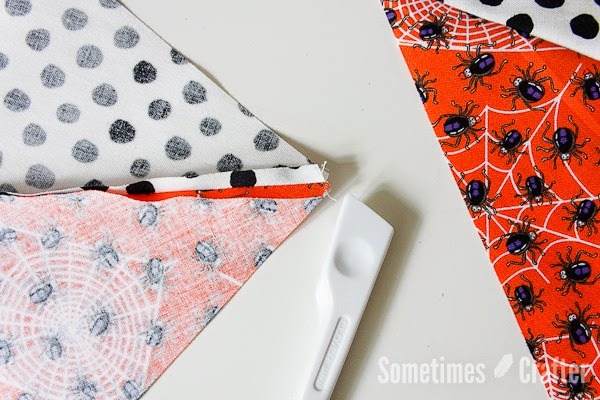 Head over to Christina's blog and enter to win a fat quarter bundle of Spooktacular so you can get in the fall spirit! This is the second of six autumn and/or Halloween themed tutorials coming your way, from Wednesday, October 1 through Wednesday, October 8. Be sure to check out all six and enter for a chance to win a fun fall fabric bundle! I have enjoyed all of your tutorials and the Feels Like Fall Blog Hop is no different. These are so well written and so easy to follow. These tutorials just really help all of us and we all know that we can make these ourselves. Sometimes we just need guidance and we know that we can count on you showing us how to go about this. Thank you so much for sharing and for being a part of our lives. I've had that kaleidescope ruler for a long time but never used it. 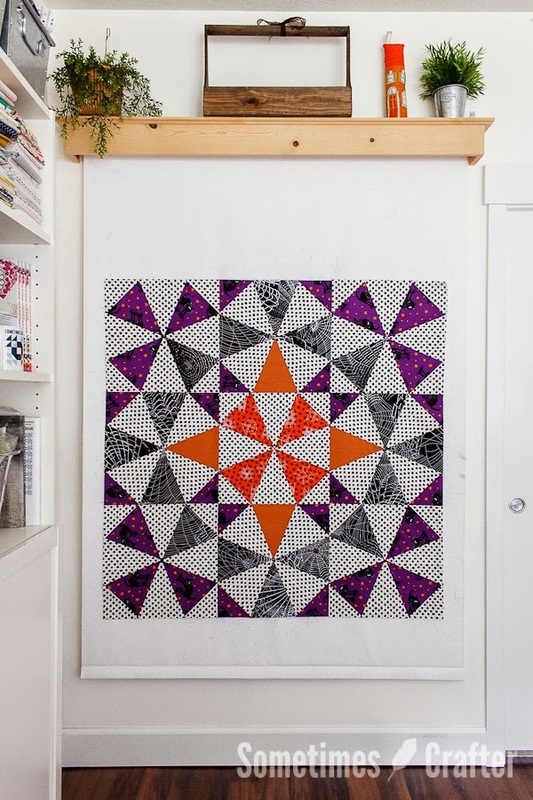 Your quilt with the medallion created by color placement is a fabulous idea. I love the circular illusion too and yet just one block. Your tutorial with its details and photos encourages me to get out that ruler and USE it. Thanks. Love this pattern! Thanks for the Tutorial!! Can see I neeeed this Ruler! Sooo fun! I've never tried this pattern because for me look a little tricky . I enjoy your tutorial and tips and hope to try it.Your quilt and fabrics are fabulous.Thanks for sharing! I have that ruler!! Impulse buy for me too, but I've never used it - now I can, thanks to you!!! Thank you for the great tutorial!!! Never heard of the kaleidescope ruler but I love.the effect it gave for your quilt! These prints are gorgeous and fun. Great quilt - thanks for the tutorial Christina! Stunning! Love the background with the dots. Thanks so much for the tutorial! This is quite a detailed tutorial! Love the result! Love this quilt. Kaleidoscope was one of the first blocks I learned to make, and I love its movement. Excellent tutorial. We think alike. Thanks so much for the tutorial, Christina! I love this quilt!! Love your tut and the results are fabulous. Oh, to have the time to do all these things. I have signed up to follow you on email. Thanks. That is really wonderful. I think I am going to have to locate one of those rulers and make one for myself. The fabric choices in it are great! That is one beautiful wall hanging. My and husband and I really love Halloween and enjoy having Halloween décor in our home,. What a great looking quilt! Those fabrics are awesome! My favorite color is purple so this quilt caught my attention immediately. LOVE IT! 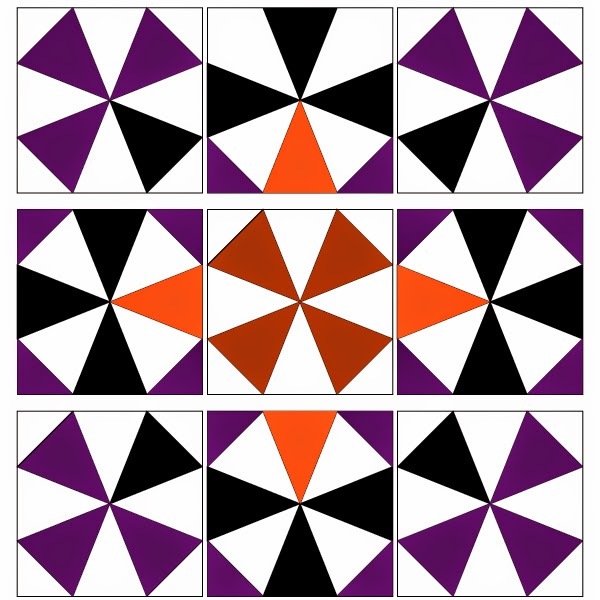 I have seen purple combined with orange before and was afraid to do that myself, but her quilt makes me rethink that thought now. I really love the look of this quilt with these colors. Thank you. I'm with you--I love the way these straight lines give the impression of curves. 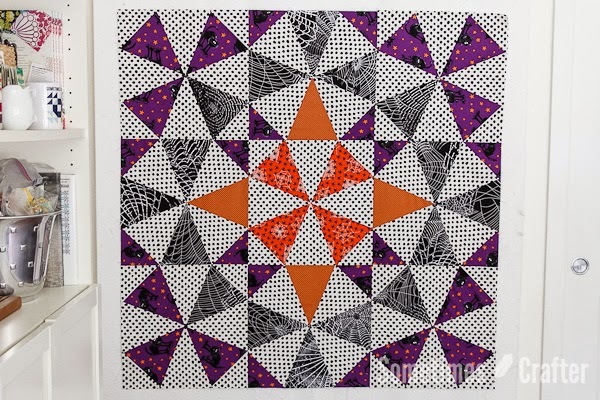 Somehow, that illusion seems especially appropriate in a Halloween quilt. 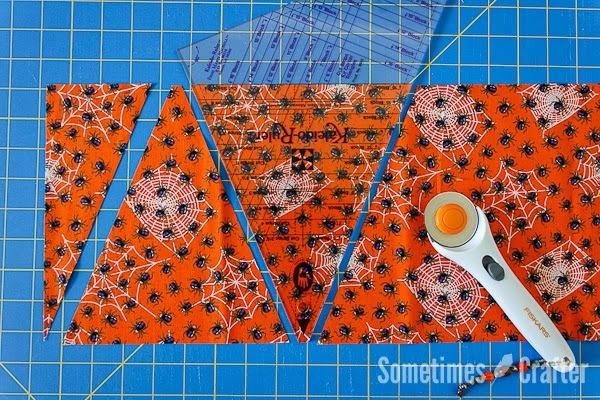 I can't say exactly why, but this layout of the quilt just screams Halloween to me! Amazing quilt! Great choice of color as well. Your tutorial's great and love that you included lots of pictures. I think spider webs for the quilting would knock this quilt out of the park! Love the flow of the colors on this one!